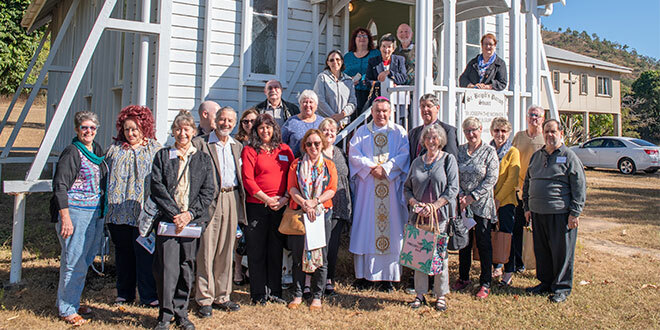 National conference: Attendees at the National Conference of Catholic Diocesan Archivists are with Bishop Tim Harris after Mass at St Brigid’s Church, Stuart. IN an age of instant gratification and short-sighted social media, the idea of preserving old books and artefacts might seem out of place, but it has been the aim of Australian Catholic diocesan archivists for decades – and for good reason. These archivists came from around the country to meet in Townsville for the 16th annual National Conference of Catholic Diocesan Archivists on June 20 and 21. The conference included Mass celebrated by Bishop Tim Harris at the old, unused St Brigid’s Church, Stuart. “These people provide vital work to our Church,” Bishop Harris said on Twitter. Townsville diocesan archivist Helen Lucas said the conference was all about sharing knowledge and methods to best preserve the history of the Church. Mrs Lucas said historical preservation had proven vital in the past when the Church had gone through transition periods for the “process of assessment and decision-making about where we go from here and how we go about it”. “It’s important that we do have that material stashed away that people can go back and look at it,” she said. The conference has been an important way to spread these practices across the country and even to New Zealand, with an Auckland diocesan representative in attendance. The conference included two field trips to James Cook University and to Jezzine Barracks’ museum. “That was an interesting talk about how some of the archival material has come out of the Second World War, much of it exposed to the tropical environments of New Guinea and places like that,” Mrs Lucas said. The conference had a focus on preservation in the tropics. The practice of archiving comes from Catholic canon law, which stipulates every diocese has to have an archive. Policies such as these have been the institutional bedrock of the Catholic Church. Mrs Lucas said when faced with the short-sighted society around them, the archivist’s job held special significance – to “preserve the ideas and the life of the organisation”. “We really have to preserve our history, we really do; some people don’t value history but it’s there all the time and it needs to be preserved,” she said. Fortunately, most 2000-year-old organisations understand the value of history. “We (Catholic diocesan archivists), as an organisation, have the support of our bishops and archbishops – most people have really significant support,” Mrs Lucas said. The conference was held at the purpose-built Townsville Catholic Archives. Next year’s conference will be held in Canberra.